On Tuesday 2 December 2015 a full bench of the Supreme Court of Appeal delivered a beautiful, globally significant judgment. In essence it said that the Department of Basic Education’s (DBE) failure to provide learners in Limpopo with their textbooks directly infringed on their rights to basic education, equality and dignity and amounted to unfair discrimination. The DBE’s appeal in the Limpopo textbooks saga was therefore dismissed and Basic Education For All’s (BEFA) cross appeal was upheld. The Court also found that the DBE was in breach of previous court orders. On 17 May 2012, the first order of court in the Limpopo textbooks case declared that: “the failure of the Limpopo Department of Basic Education (LDoE) and the Department of Basic Education (the DBE) to provide textbooks to schools in Limpopo [was] a violation of the rights to a basic education [and] equal dignity”. Twenty-one years into our democracy - and after three more High Court orders from Kollapen J and Tuchten J in a similar guise – the State appealed to the Supreme Court of Appeal in Bloemfontein, arguing that this was an “impossible standard of perfection” and that the right to a basic education only requires a reasonable plan for realisation. Basic Education For All (BEFA), SECTION27 and the South African Human Rights Commission argued that the right is immediately realisable and requires the state to do everything possible to fulfil the right. Critically, the judgment made important pronouncements on the rights of learners in Limpopo to have access to a full complement of textbooks at the start of the year and on the State’s obligation to learners. In a critical year in which court orders have been flouted by the State, such as in the Bashir judgment, BEFA and SECTION27 call upon the DBE to respect the rulings of the court and ensure that the learners of Limpopo in particular, their parents and communities as well as other learners throughout South Africa truly experience a better life for all that was envisaged for the nation by those who fought for freedom. This judgment is a vindication for BEFA and its members, who have been intimidated for standing for the rights of learners but continued out of conviction. It is also a vindication of the many unsung heroes who have fought for the right to basic education in Limpopo at great personal expense. These individuals include Solly Tshitangano who as acting chief financial officer in the LDoE shone a light on the corruption in the department and brought the story of the Limpopo textbook saga to the attention the nation. BEFA and SECTION27 believe that the Limpopo textbooks saga is unnecessary and the legal action that has ensued as a result of the State’s recalcitrance is unwarranted and wasteful expenditure. 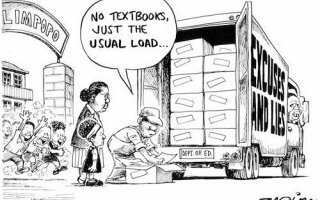 Through all this a generation of poor, black students in Limpopo are still without their full complement of textbooks and continue to be condemned to lives of intellectual and material poverty not dissimilar to that of their parents’ generation. Read the full judgement, here. Read the media summary, here.